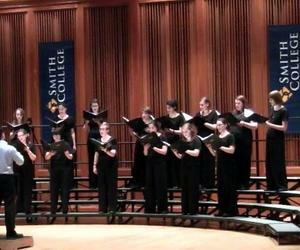 The choir of former students of the university for women Smith College, of the United States, will perform with Cuban choirs on July 28 and 29 in stages of the capital and of Matanzas. Under the direction of maestro Jonathan Hirsh, the choirs will interpret a vast repertoire, from which they will together perform Gloria, by Italian composer Antonio Vivaldi, and Stabat Mater by his fellow countryman Giovanni Battista Pergolesi, as announced by the Cuban Music Institute. The Exaudi Choir, the Schola Cantorum Coralina, Vocal Leo, Coro D'Profundis Choir, the Camerata Vocale Sine Nomine, the Musica Eterna Chamber Orchestra, and the Chamber Orchestra of Havana, are the groups that will perform with Smith College. The first presentation is scheduled for Thursday, July 28th at 6:00 p.m. at the St. Peter the Apostle Church of Reparto Versalles, Matanzas, and the second will take place at the Covarrubias Hall of the National Theater, On July 29th, 8:30 p.m.
Smith College is a prestigious university only for women, located in the town of Northampton, Massachusetts, and was founded in 1871. It has a long tradition of musical excellence and its singers represent more than 40 graduations.